(NASCAR Wire Service) TALLADEGA, Ala. – Aric Almirola charged into the lead with four laps left in Saturday’s Sparks Energy 300 at Talladega Superspeedway and held off Elliott Sadler at the finish to win the third NASCAR XFINITY Series race of his career. With the Ford of Darrell Wallace Jr. plowing into the inside backstretch wall behind him on the final lap, Almirola held the top spot to the finish, beating Sadler, the series leader, to the finish line by .142 seconds. 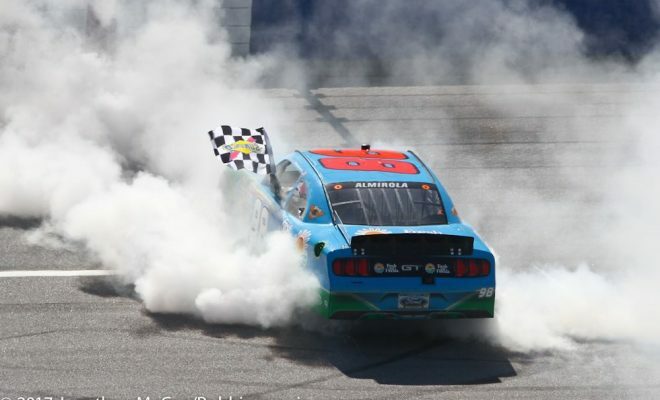 The win was Almirola’s first of the season in four starts and his first at Talladega. The No. 98 Ford he drove was fielded by the Biagi DenBeste race team. In a race that featured five cautions and two wild wrecks, Almirola unintentionally did his own part to help thin the field. Attempting to bump-draft Ryan Reed’s No. 16 Ford on Lap 50, Almirola tapped the rear bumper of the Roush Fenway Racing car too far to the right side and turned it toward the outside wall. The result was a seven-car collision that eliminated polesitter Blake Koch and Brendan Gaughan, among others. Joey Logano ran third, followed by Ben Kennedy and Erik Jones, who led the race with five laps left but couldn’t hold off the charge of Almirola on the next-to-last lap. 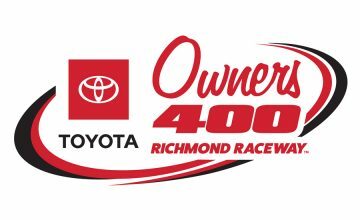 Matt Tifft, Michael Annett, Justin Allgaier, Daniel Suarez and Jeff Green completed the top 10. Sadler scraped the outside wall on Lap 5, thanks to a misguided push from Logano, but he recovered to snag the runner-up spot. 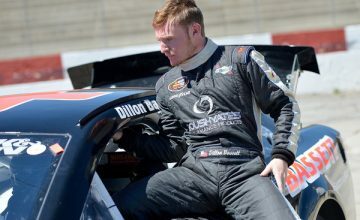 In fact, Sadler felt his team’s need to work no his No. 1 JR Motorsports Chevrolet kept him out of harm’s way with respect to the later wrecks. “We were just one spot short today,” Sadler said. Kennedy was racing for the first time since the 2016 season-ending NASCAR Camping World Truck Series event at Homestead-Miami Speedway. Note: There were 28 lead changes among 14 drivers in a highly competitive race. Almirola led 13 circuits. Allgaier was out front for a race-high 24 laps. The National Association for Stock Car Auto Racing, Inc. (NASCAR) is the sanctioning body for the No. 1 form of motorsports in the United States. NASCAR consists of three national series (the NASCAR Sprint Cup Series, NASCAR Nationwide Series, and NASCAR Camping World Truck Series), four regional series, one local grassroots series and three international series.